Dr Blood's Video Vault: My last pawn shop adventure? My last pawn shop adventure? I'm getting a bit bored with going to the pawn shops. It's probably because I go to the same one every week only to find that there's hardly anything new. All the big boys are going to FYE now but that's miles away from me and they have such a bizarre pricing system there that I have no idea if I'm getting a bargain or being ripped-off half the time. For instance, I could buy "Teeth" there for $2.99 brand new from their bargain bin (which I still might) or I could buy it used for $5.99. How does that work exactly? Another oddity about FYE's pricing system is how single movie DVDs can cost more than the multi-packs which include the same movie plus three more. An example of this, which I saw earlier in the week, was "Bride of Chucky" for $12.99 while right next to it was the four Chucky sequels pack (which doesn't have the original "Child's Play" in it for some bizarre reason) for $9.99. Don't they have someone to go through their stock who would think, "Hold on, this isn't going to sell when customers can get more movies for less money"? I would even pay $2.99 for each of the Chucky sequels individually just to avoid the first two crappy ones, but $12.99? No. Anyway, since I like to pay even less than that usually, here are my latest and probably my last "4 for $10" finds. I'd been leaving "Frozen" (2010) in the pawn shop for some poor soul who hasn't seen it to get a nice bargain for $2.50, but it had been there for 4 months with no takers so I got it myself. It's not really horror but it was very nicely done, at least technically. Even though the story was a bit far fetched and made me want to slap some sense into the characters, it's definitely Adam Green's best work as a director so far. Also, as much as I moan about the hipstery faux-grindhouse movies of Tarantino and Rodriguez, getting the two-disc special edition of "Planet Terror" (2007) at a bargain price was worth it. I'm not going to say that I'll never buy the other one, "Death Proof", but I really didn't like it as much. If it does show up then I'll get it for completeness (although I can definitely live without it). I now have my own copy of "P2" (2007). I'd been meaning to get this for the last five years but just didn't see it anywhere after I rented it from Netflix. I'd still say that it isn't really horror so much as a thriller, but I liked it. 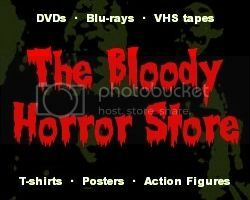 Finally, and this really might be the last DVD I ever buy from my local pawn shop, "Theatre of Blood" (1973) completed my four. This particular DVD had been on the bottom shelf of that pawn shop for the last four years since I'd been going there. It was still shrink-wrapped (albeit torn and now removed entirely by me). If I hadn't seen the film on one of the satellite channels just before moving to America, I might have bought it sooner. It has taken me that long to be in the mood to watch it again, basically because I'm getting older and a bit nostalgic. I don't think it's a particularly rare DVD (apart from on eBay where there are some stupid prices being asked for it), and, obviously, the title is spelled incorrectly (unlike the $39.99 version! ), but it'll do for a Sunday afternoon later in the year when I'm really bored or snowed-in. So, that's it. My horror DVD shelves are now full of nearly everything I like and I will probably be switching my allegiance to FYE for any future individual and/or more specialised purchases. I think that, over the last four years, I've spent slightly over $1000 on used R1 horror DVDs and acquired titles which would normally have cost at least five times that amount. With every day that passes, they are all worth even less though. If I was to sell them all back to the pawn shop, I expect I'd be lucky to get even $200 for the lot and then it would be as a store credit rather than cash. One day, I'll either have to sell them all at a yard sale or throw them away as the "disc rot" kicks in, but, for now, with at least 100 movies in my collection which I have never played, I'm just going to work through them and continue to review them on this blog.